According to a recent Forbes Insights report focused on a big and growing challenge facing companies in their customer-acquisition efforts, “silos—both within and between marketing and other departments—are the scourge of many marketing departments.” But the report was silent about what is probably the biggest gap of all: that between marketing and sales. Studies indicate that less than 40 percent of firms believe their sales and marketing units are aligned with what their customers want (Miller Heiman Sales Best Practices Study). In addition, 80 to 90 percent of marketing collateral is considered useless by salespeople. And, despite well-publicized investments in CRM and “big data,” simple lead generation from marketing to sales remains a constant source of complaints in both functions. If this is true for marketing and sales—areas directly concerned with customers—then silos also affect key functions to execute your strategy for profitable growth. So why the silos? A McKinsey study found the average company with more than 1,000 employees already had more data in its CRM system than in the entire Library of Congress. These firms undoubtedly have even greater data now. The silos are not just bureaucracy; they also reflect expertise requirements. Hence, it’s not good enough to preach teamwork at the annual off-site meeting, and the goal is not to eradicate these differences. Rather, the issue is how to effectively link knowledge and capabilities located in different areas across a firm. In business, external responsiveness requires internal coordination. Few managers are against teamwork. But coordination costs money, takes time and prolongs decision making in a world where product/market lifecycles have less time. Hence, it’s important to isolate activities where coordination is important and is worth the time, costs and effort. Marketing and sales have inherent interdependencies along a range of activities, including market research, advertising and lead generation, pricing, promotions, sales presentations and post-sale service. On organization charts, these activities are grouped into labels like product management or distribution; however, they’re more usefully viewed as a continuum where, as in a relay race, the achievement of each unit’s tasks depends upon the plans and actions of the other. Market research should be informed by selling activities at target accounts; pricing must be implemented by sales channels; and profit margins are affected by activities during the selling cycle, not simply the difference between price and the cost of goods sold. Isolating these activities wastes a large portion of your firm’s money and morale. A first step to ending the isolation is identifying those you depend on to get your job done and jointly clarifying the “rules of engagement.” Many managers find it helpful to outline these dependencies and rules on a simple balance sheet: what must you get from the other group to do your job effectively, and what must your group give to the other for that group to provide it most efficiently. In his studies of persuasion, Dr. Robert B. Cialdini, President of INFLUENCE AT WORK (IAW), emphasizes that reciprocity—what he calls “the old give and take”—drives influence. He cites much evidence suggesting that virtually every human society subscribes to the principle and “it permeates exchanges of every kind.” It’s no coincidence that many sales reps leave a gift for the receptionist or other gatekeeper who handles the customer’s schedule; or, at their own firm, for the product manager who customizes a product for a given account; or for the service rep who expedites that order up the queue. What happens individually should also happen organizationally. Leaders who rely only on structure, compensation or exhortations and fail to clarify these give-and-get rules are handicapping their ability to align marketing, sales and strategy. Louis Gerstner, reflecting on his experience as former CEO at IBM , put it well: “I came to see, in my time at IBM, that culture isn’t just one aspect of the game—it is the game. In the end, an organization is nothing more than the collective capacity of its people to create value.” When Gerstner arrived at IBM, he decided—against much advice—not to break up the firm. Instead, he based strategy on providing integrated product/service packages customized to vertical sectors. At the time, IBM was a wilderness of silos without rules of engagement for working across functions, sales units, product groups, and marketing initiatives. The first step was clarifying the rules, given the strategy. The second was then restructuring around specific industry groups. The last was to redo compensation and incentives. Business history suggests that you can’t do it the other way: starting with compensation or structure and then behavior. Gerstner is right: it’s culture—human performance and behaviors—that drives operating and financial performance in any firm. Customers rarely see or care about the rules of engagement with their suppliers. But those behaviors ultimately elicit customer praise or complaints and directly help or hinder the execution of strategy. 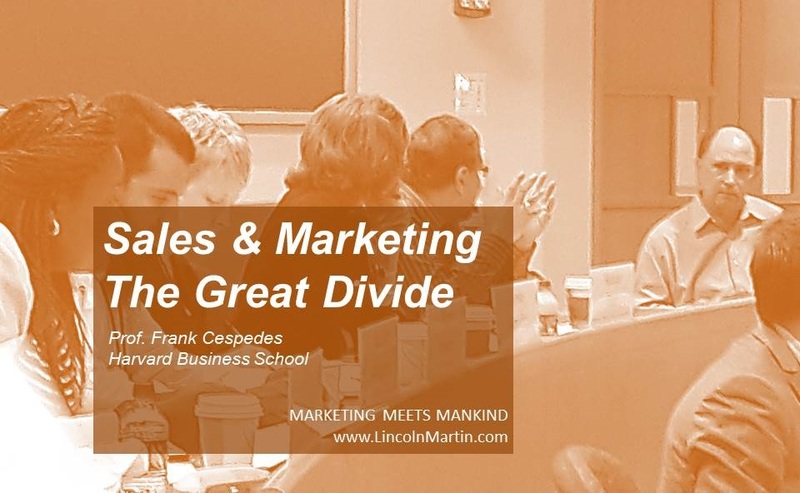 Frank Cespedes is the MBA Class of 1973 Senior Lecturer of Business Administration at Harvard Business School. He has run a business, served on boards for start-ups and corporations, and consulted to many companies around the world. He is the author of six books, most recently “Aligning Strategy and Sales: The Choices, Systems, and Behaviors that Drive Effective Selling,” and many articles in Harvard Business Review, The Wall Street Journal, California Management Review, and other publications. Follow Frank on Twitter @fvcespedes.